The 1970s gas crisis brought us a whole bunch of neat little pickups, and even the Germans wanted in on the game. While their truck was not a raging success in North America (apparently nobody likes a front-wheel-drive truck), they took off well in other parts of the world and were sold in South Africa until 2007. 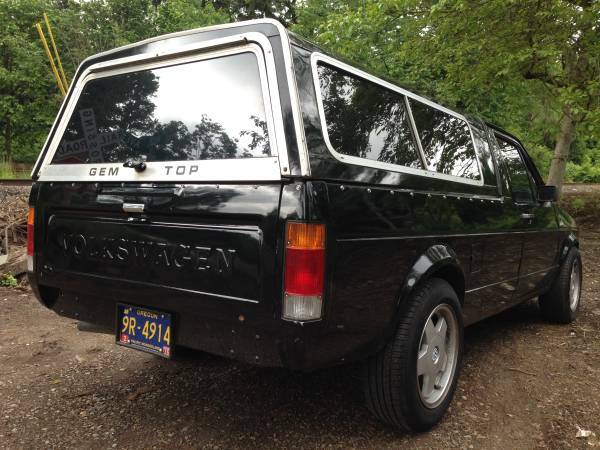 The 1970s and 1980s desmogging era also brought us some pretty ridiculous sticker and spoiler packages.One of those was the VW Sportruck, which featured a front spoiler, name stripes down the side of the body, additional gauges including a “chronometer” (isn’t that how the Europeans measure distance? six chronometers to the next petrol station? ), and some other minor upgrades, but the same engine as every other Rabbit Pickup (0-50 in 9.7 seconds!!). 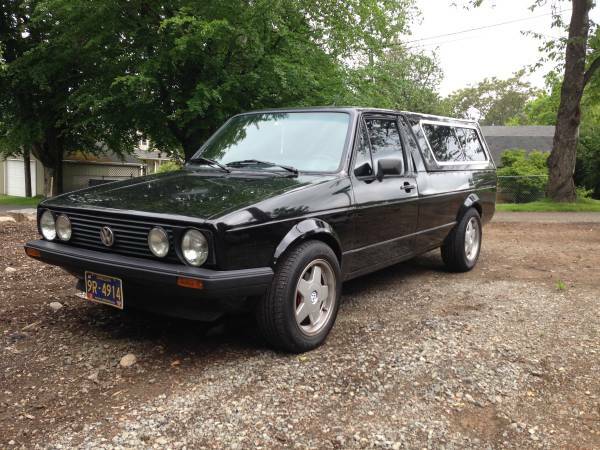 Fortunately, today’s feature vehicle has all the sport on the inside, and is fairly subdued on the outside – check out this 1980 VW Rabbit Pickup, for sale for $4000 in Portland, OR. The seller does not give a lot of detail in the listing, but it’s clear this was a tastefully done conversion of a regular pickup (and not a Sportruck, as those only debuted in 1981). Black paint, Cabriolet grill, hood and fenders with big-and-little headlight setup, a Euro/Cabrio-style front bumper and reasonably sized alloy wheels make for a smart, understated package, but one that any VW fan will notice has been updated. Even the pickup shell has been finished in shiny black, and there appear to be snaps for buttoning on a tonneau cover when you’re not using the shell. 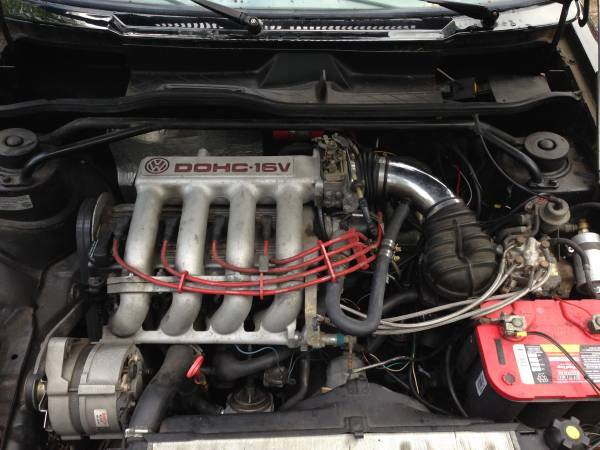 And here’s the best part – a 16 valve engine from a GTI, making this a true Sportruck. It’s paired with a 5-speed manual transmission, and while no further details are given, the pictures also show a strut bar and gel cell battery. Check for upgrades to the brakes and suspension – with such a thorough build, you would expect those as well. If they’re not present, there’s your opportunity to get underneath and get familiar with your new toy. 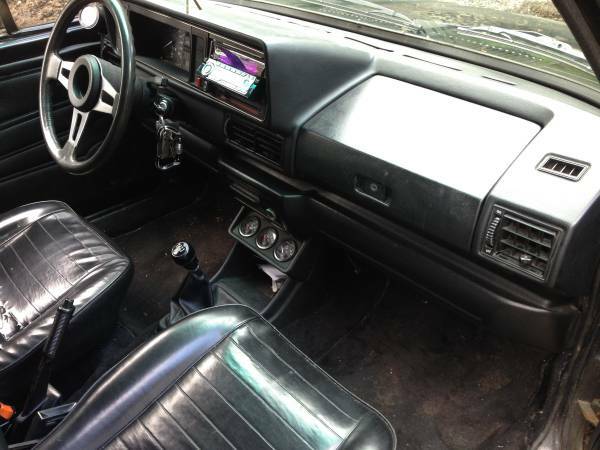 The interior has several of the Sportruck/GTI upgrades – a tachometer, clock, voltmeter, and oil temperature gauge. There are also a couple of additional gauges to the left of the main cluster, though the seller, being a person of few words, does not explain their function. The truck also has a GTI steering wheel, fancy pants modern stereo, and later style dash, which is surprisingly free of cracks. Your opportunity here is to find a suitable solution for the driver’s seat, since the vinyl is cracked and torn – would you go with a 1980s Recaro, a US GTI seat, fix what’s there, or find another stock seat? Poised and ready to go! For the dollar, this looks like better performance value than yesterday’s Ford Courier. So what’s your poison? Old-school, plain-Jane compact truck with all its charms, or updated sports truck? Oh, and if you want to shout a little louder, SPORTRUCK decals are being reproduced. This entry was posted on May 23, 2014 at 10:53 am and is filed under Feature. You can follow any responses to this entry through the RSS 2.0 feed. You can leave a response, or trackback from your own site. It’s already gone; I like this one.